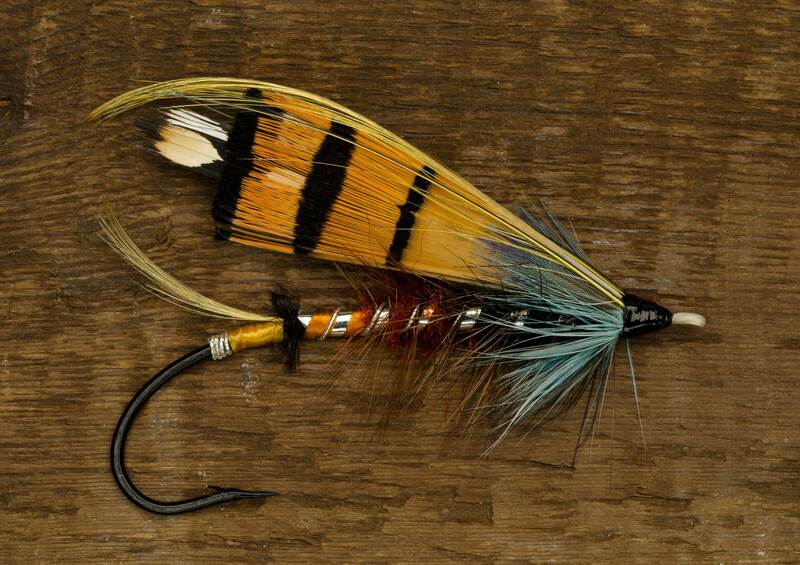 “The Green Highlander is an iconic fly for Winsnes because it was created, like Storstuu Winsnes, in 1882. We will never know whether the fly was used by the Gordon party that same year but in subsequent years the fly became Gaula’s most successful pattern. Salmon flies with a decent proportion of green are not generally popular but this fly works beautifully on Gaula. The yellow/green tint of the river’s water probably has something to do with it. This fly is one of the original classic feather wing flies. 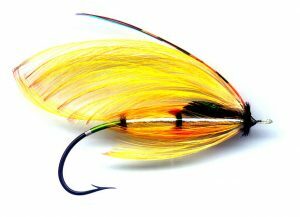 By the time that the fly was reinvented with bucktail hairwing, it still retained the original wing colours of yellow, orange and green with brown over. In modern times, with the rise of the templedog style tube flies (which were incidentally invented on Gaula), it more common to see a black than a brown over-wing. The fishing lodge can provide equipment for use by visitors but most of our guests bring their own. In our rod room, we keep a stock of self-inflating life vests and wading sticks. We encourage our guests to use them, especially the life vests which are of the Crewsaver type that don’t hamper movement when casting. We recommend 13 to 14 foot rods in either #8/9, #9/10 or #10/11. Whilst the heavier rods are most popular in June, the #9/10 is the most versatile choice and the #8/9 a very good option after the middle of the season. Anglers seeking to fish with single hand rods should look to rods around 9 feet or 10 feet long rated at #8, #9 or #10. This is the area that causes our staff the most concern since many of our guests, used to salmon fishing in Scotland or Ireland, use fishing reels that are simply not up to the rigours of fighting a big, fresh-run Gaula fish. A reel with a reliable drag that can be cranked up to prevent a really big fish from running into danger. Please check that your salmon fishing reel has proper drag, not an enhanced ‘clicker’ and if it does not, change it! Most of our guests use shooting head fly lines and we keep a good stock of the lines that we most commonly use. Shooting heads are shorter, easy to change and available in a whole range of combinations of different sinking densities from full floating through to deep sinkers and lines which combine densities for improved presentation. Lines, flies etc, can be purchased in our lodge shop but guests can, of course bring their own. We use and recommend lines in various sinking rates and densities, depending on the conditions and our staff are trained to help you choose the best line given the prevailing conditions and if necessary, modify them so that they work at their best with your rod. Whilst shooting heads are the most popular choice, traditionalists will like the fact that Spey lines also work well on Gaula. Flies big and small will be found in a typical Gaula fly box, such is the difference in the water level between the beginning and end of the season. As a general rule, we use big tube flies in the early season (10-15cm) with very small flies (down to size 14 wee doubles!) taking over in August. It would be impossible to list every fly here but at Winsnes Fly Fishing Lodge we have tried and caught on a huge selection of flies over the years, including floating flies and those festooned with rubber legs and other distractions. Generally speaking, tube flies are the most popular choice because Gaula fish just love to take a swipe at them! The mobility of modern winging materials and arctic furs has created flies that are so mobile and sinuous in their movement that they are hard to improve on. In trying to create that ‘illusion of life’ that a good salmon fly should possess, the modern fly tying materials have transformed the art of fly tying. Unusual flies: bombers and other skating flies, rubber leg tube flies and nymphs, heavily weighted nymphs, large dry flies (for dead drifting) – during August there is plenty of room for experiment! Many of our customers use leaders and hooks that will simply not cope with a very large Gaula fish. Use Scottish grade salmon equipment at your peril. If one of our guides advisees you to change tippet or hooks, its not a cheap shot to sell you something and you should act immediately. Over the years we have seen numerous tales of woe when guests have lost fish through poor hooks or weak leader. Typical leader strength for Gaula is around 40 pounds in early summer, 30lbs in high summer and around 22-24 pounds at the end of the season. Anglers can use double or treble hooks on Gaula – we prefer doubles for hook hold and for unhooking fish with minimal damage. We sell a good range of hooks and leader materials in our lodge shop if you are short of the tough stuff! We insist on fish being netted wherever possible. Most of our pools have a resident net and there are also extra nets available at the lodge for guest use. Waders are essential for fly fishing on Gaula. We sell waders and boots at our lodge shop should you need to buy replacements. Bring layers! The Norwegian summer can provide temperatures that vary from just 6 degrees celsius up to mid-thirties! Large temperature swings are quite common within the same day or week, so layers are a must. Whilst most of our guests assume that the Gaula will be rife with mosquitos, generally it isn’t. Warm, damp conditions make mosquitos more active and present but they never reach the horror levels reported in Russia. Most days, mostuitos are not a major problem but those whom react to being bitten by them should bring effective repellant and soothing cream. Long-sleeve shirts and base layer micro fleeces with long sleeves certainly cut down the risk of being bitten. The small black flies, often called ‘no see ‘um’s’ can be experienced usually for a week or two during July. These small flies are very irritating and usually appear on calm, windless evenings. Popular choices for dealing with flies and bugs include Skin-so-Soft and Eurax. These skin creams seem to offer decent protection and relief in equal measure. Please contact us via email for any information that we have not provided on this site that might be valuable to you. Please visit our social media links below to keep up to date with all the latest news and product information.